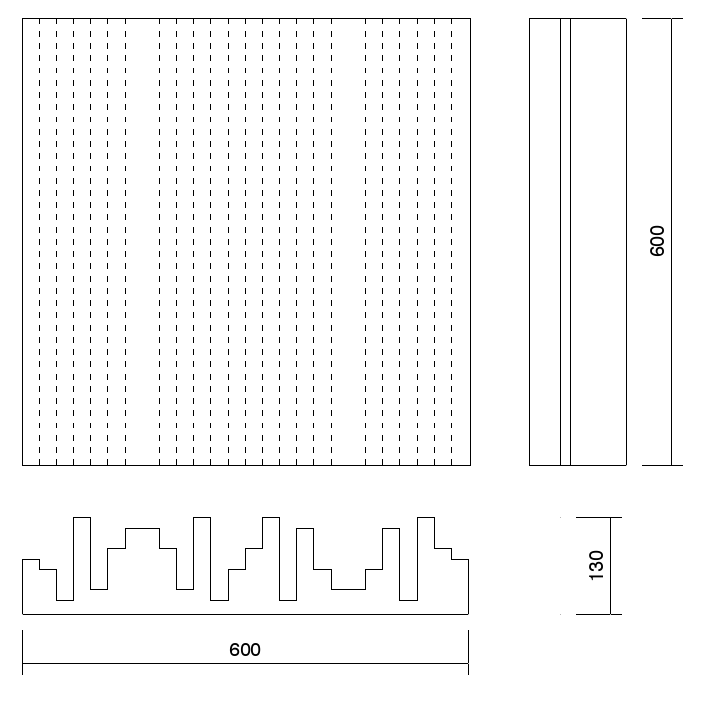 One-dimensional QRD sound diffuser of 600 x 600 mm (130 mm thick). Boxes of 4 units, manufactured in high-density EPS. Colour: white. Optimal sound dispersion from 630 Hz to 8 kHz. Sound diffusion is the final piece in the jigsaw puzzle of acoustic treatment that, when used coherently, is capable of transforming the good acoustics of a room into excellent acoustics, therefore providing the sound setting with a sense of spatiality via the dispersion of undesired reflections and the breaking of floating echoes, free of additional absorption. KONTUR is a one-dimensional sound diffuser based on a QRD (Quadratic Residue Diffuser) mathematical sequence that has been innovatively optimised to reduce the comb filter phenomenon that often occurs in diffusers designed with periodic mathematical sequences, therefore achieving an exclusive diffuser with an excellent level of sound dispersion in the range of frequencies between 630 Hz and 8 kHz. It is manufactured in high-density EPS, which makes the diffuser extremely light and enables it to be easily installed on walls and ceilings using a neutral assembly adhesive (Skac Adhesive) at a contained cost which, along with its performance, make this device an unrivalled sound diffuser. The material of a KONTUR diffuser means it may be painted (using water-based paints only) without affecting its diffusion performance. Its quadratic design means it can be turned 90º to achieve sound dispersion along multiples axes. 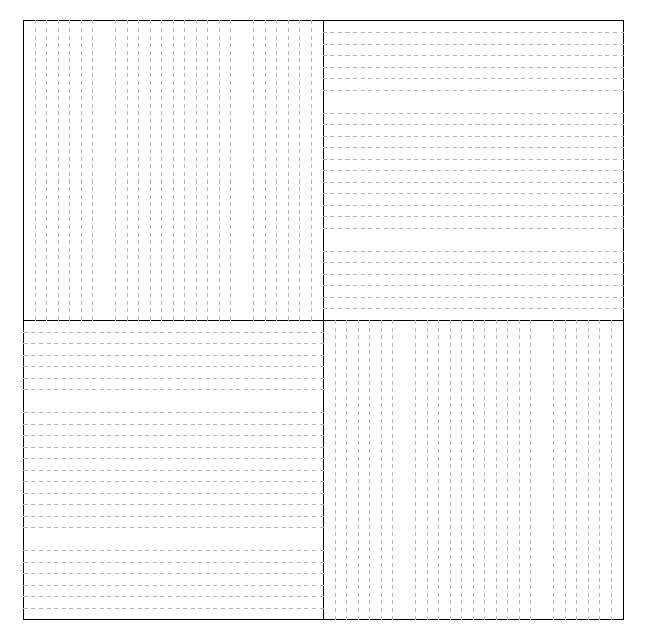 The combination of diverse units, alternating their orientation, enables the achievement of a two-dimensional set with optimal incident sound diffusion in all directions of the space. Sound diffusers with an optimised QRD design (Quadratic Residue Diffuser). Designed with mirror-image sequence to eliminate the comb filter effect. Optimal performance in the range from 630 Hz to 8 kHz. Its quadratic design enables a change in orientation to obtain diffusion along multiples axes. May be easily painted using water-based paints only. Sold in boxes of 4 units for optimal shipping efficiency. KONTUR sound diffusers are specifically recommended for providing spatial and temporal sound diffusion to the sound setting of control rooms, recording rooms and mastering studios. Used in a control room, the monitors will present a more precise and more expansive setting, and by placing them in specific positions they will break the floating echo (or undesired reflections). In a recording room, sound will return more naturally and with greater definition, without losing the energy common in rooms with excess high-frequency sound absorption. KONTUR sound diffusers have been designed to offer one-dimensional dispersion, which is beneficial with regards to two-dimensional diffusers, which disperse energy in two planes, especially in the design of control rooms. What format do they come in? Boxes of: 4 units – total coverage: 1.44 m2. To obtain maximum dispersion performance throughout the range of frequencies used by the sound diffuser it is recommended a minimum distance of 1.3 m from the diffuser and the listener is maintained. 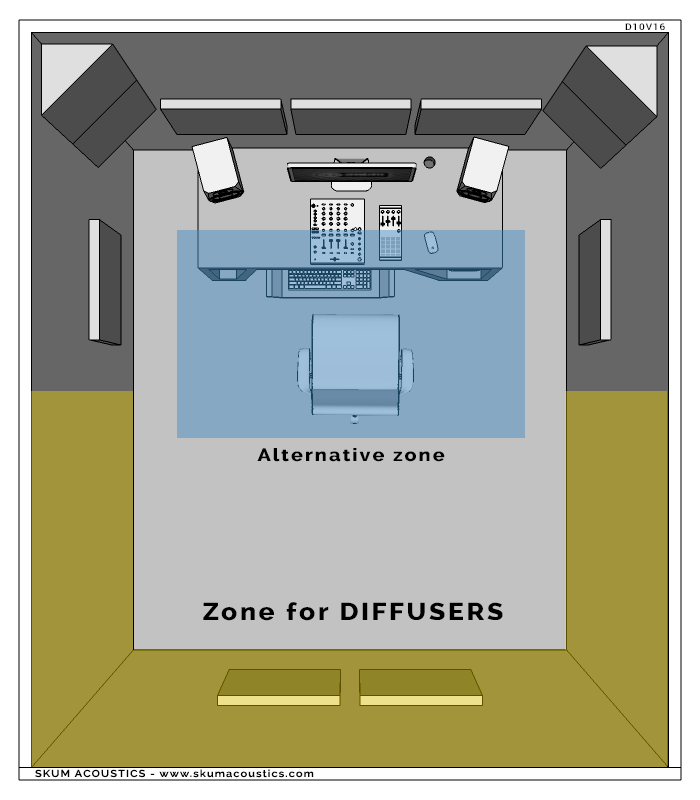 The diffusion sound field in a LEDE room (in control rooms) should come from the rear or rear sides: if the rear area cannot be used, installing the diffusers on the ceiling can be an appropriate alternative. Identify positions A and B of the diffuser in the following image. In recording rooms, install the diffusers by forming matrices of 2 x 2 (1200 mm x 1200 mm), alternating the dispersion axis of each element (turn each unit 90º) to obtain a two-dimensional diffusion set.